Current production lead time is running approximately 8 weeks from order date. 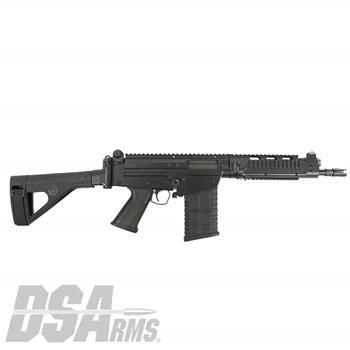 The DS Arms FAL SA58 OSW pistol is based on our iconic OSW Short Barreled Rifle, just in a PISTOL configuration. The OSW pistol come with our 11" barrel threaded 5/8x24, ambidextrous magazine release, SAW Style Pistol Grip, Extended Winter Trigger Guard, Dual Aperture Rear Sight , short length 1913 Spec. Picatinny Rail Handguard and a side folding SB Tactical SOB Arm Brace Installed. These features and upgrades coupled with the FAL's ruggedness and durability make this FAL pistol the perfect start to or addition to any FAL collection! 4140 Fully Machined & Heat Treated Cast Steel Type 1 Non Carry Handle Cut Receiver. Short Length 1913 Picatinny Spec. Rail Handguard. Includes Side Folding PARA Knuckle Assembly. Includes SB Tactical SOB Arm Brace. Owners Manual, Hard Case and Sling Included. Not available for NY, NJ, MA, Washington D.C., CT, CA or HI. Manufactured by DS Arms - All Parts U.S. Made! FAL Pistol Must Ship UPS Air Service - Signature Required, as such this item has a flat shipping fee of $50.00 per unit.